Are You Looking For a Scituate Painting Contractor Today? Artisan Painting and Decorating, Inc. is a unique combinative partnership. Brian Pearson brings vast product knowledge to an industry where technical specifications are always increasing. He also brings a youthful approach to a very busy and competitive marketplace. While Jim Liquori brings time proven application techniques, specialized finishes and a lifetime of experience to a market saturated with average Scituate painters. The goal of Artisan Painting and Decorating, your Scituate painter, is to provide an end result that will separate us from the field and to provide you with the highest quality finishes using the highest quality materials and the most professional painters. Cleanliness is always a top priority. We carry all the proper insurances and we carry a Home Improvement Contractors License. Let us know how we can help you on your next project. At Artisan Painting and Decorating, the innovative tools our Scituate painting contractors use allow us to achieve decorative painting techniques that are the most popular at nearly half the time, hence, less time means less cost. 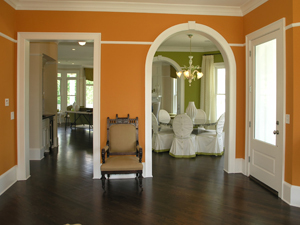 Faux Painting is the fastest growing form of decorative painting there is. We offer professional Scituate faux finishing services. Whatever your goals, color and texture can make a huge difference in how you feel about your home. We will help you select the correct color scheme and finishes that evoke your personal style. There are several finishes to choose from or we can custom create a Scituate decorative finish that is perfect for you. Mold, mildew, ground-in dirt and loose paint are no match for our Scituate power washing technicians. Your home is likely to have collected years of soot on its exterior, may get a constant onslaught of dust. You may also see the exterior of your home develop black and green mold which isn't good for the health of your family. If you have ever noticed that your gutters are containing a black streak. Our Scituate power washing services, using only commercial grade detergents, can eliminate that problem for any Boston homeowner. Even if you are not painting your home, you should be washing your house at least once a year. Power washing your home spruces up the exterior of the home and makes it look much cleaner then before. Inside and out, residential house painting is a big job! You want an end product that will protect your home from the elements and increase its value and appeal. For your home's exterior, you want to be sure your new coat of paint can survive hot summers and cold winters without blistering, cracking or peeling, and that it will properly seal your home's interior from moisture, mildew, dry rot, termites and other damaging environmental factors. When you decide to hire a professional Scituate residential painting contractor to handle your Boston painting, it can be hard to know which companies you can trust to do a good job. After all, your home is probably your biggest investment and you want to be sure that the job is done right. Some Scituate paint contractors will leave you with less than stellar results, charge more than you expected or take longer to complete the project than they should. That's why it is so important to know what you are getting into up front. Artisian Painting and Decorating can make your Scituate house painting projects go quickly and smoothly and can give you great results. Contact us today for an estimate on your Scituate residential painting project. If you are looking for a Scituate Painting contractor then please call (617) 947-0524 or (617) 548-3649 or complete our online request form.